« Twin Charts Separated At Birth: Can You Guess Which Is Which? According to the talking heads the US stock market declined because of worries related to the “stress test” and due to the bad news from Bank of America (BAC). While these are valid events, they aren’t the main cause of the market’s weakness because they aren’t really news. Had it not been for these ‘news’ the market would have fallen on some other event or in spite of any significant news at all. At the start of the month I started pointing out that the market had com too far too fast and we were about to see another cycle high: Stock Market Rally Hitting the Wall. Since then the confirming news from sentiment, technical analysis and market internals have piled on. I use the Nasdaq advance decline numbers because the NYSE data is notoriously polluted with non-common stock securities such as ETFs, CEFs, LPs, bonds, etc. 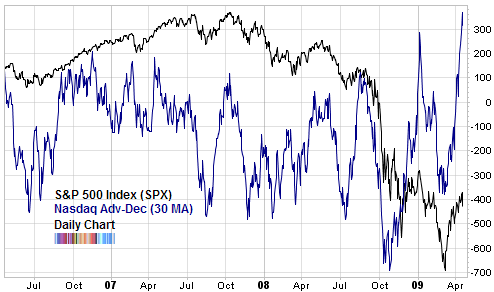 The only time in recent history we saw so many stocks participate in a short term rally was in early January 2009. To be fair, there have been times when the stock market continues to go up in spite of breadth becoming over-extended. But these are rare and usually occur at the early stages of a powerful new bull market. On Friday, it just about reached 90% and with today’s market weakness, backed down. Anything time 80% or more are above their 50 day moving average, stock prices in general either slow down their pace or simply top and fall. We’ve also seen an very rare occurrence in the same indicator’s short term perspective. 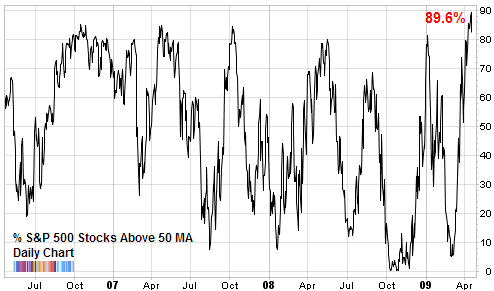 The percentage of S&P 500 (SPX) constituents that have closed above their 10 day moving average has clustered above 80% for most of March and April 2009. Finally, another measure of the market’s internal health, the Nasdaq McClellan Summation Index hit 241 today. This level corresponds to difficult going for any rally in the past. The only exception was during the 2003 (new) bull market when we saw breadth overextend beyond this with no ill effects to stock prices. As long time readers will know from the weekly sentiment overview, option traders which had been behaving in a rather uncharacteristic way throughout the bear market have now shown their hands quite clearly. They are unmistakeably bullish with a penchant for call options vs. put options (and I’m referring specifically to trades which result in a new long position in either calls or puts). By the way, don’t miss the chance to download the FREE 120 page report from Elliott Wave covering the US, European and Asian markets as well as interest rates, commodities, currencies and much more. This is the most recent edition of their comprehensive Global Market Perspective and is exactly what their regular paying clients receive. But it is only available free for just a few days. There’s no obligation to purchase anything and you only need your email. I’ll go over it shortly on the blog but get your copy while you still can.